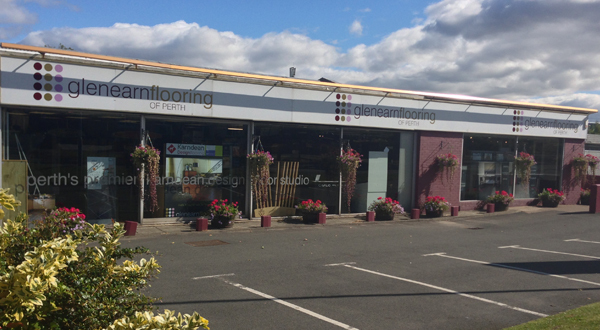 East Scotland’s Largest Independent Flooring Store situated on Glenearn Road, Perth with over 10 000 sq ft dedicated to carpets and floor coverings. Whatever your project, be it a small apartment bathroom or a prestigious hotel ballroom, Glenearn Flooring can guide you in terms of your floor covering requirements. We offer straight-talking advice backed with a full measuring and estimating service supported by a no-hidden cost quotation. Glenearn Flooring has since 1995; built up an excellent reputation through ‘word of mouth’ recommendation which now involves us in domestic and commercial projects across Scotland. Glenearn Flooring are the preferred supplier of carpets and floorcoverings to many trades, designers and local authorities. The Glenearn Flooring team of experts are long established with the firm and are arguably among the best in the business. Their no-gimmicks approach is a refreshing change within an industry that is often known for over-inflated prices and massive discounts or the trickery of freebies such as underlay and fitting. "We base our success on the fact that we are a family driven firm providing a personal dimension that is the envy of many other businesses. Our philosophy is very simple, in that we are committed to provide all of our customers with an excellent choice and quality to match. We can not praise our team enough, they have an ability to carry a massive amount of product and technical knowledge that can only come from a genuine interest in our huge and varied range. Our team are not target driven, our approach is to create a relaxed environment where our customers can freely browse without any pressure knowing that an expert is on hand to guide them when required".